"I cannot and will not give up my family time," Ryan told reporters following the House GOP meeting. That statement set off a firestorm of criticism, from the left and right. As the heir-apparent to Speaker Boehner, Paul Ryan made his need for work-life balance clear. As the father of three children, he’s right—Americans work too hard, for too long, and for too little (and inequitable) pay. Every weekend, Paul Ryan, who’s worth an estimated $7.7 million, flies home to Wisconsin to care for his three children. That’s admirable, and a huge luxury that most Americans could only ever dream of. Unfortunately, Ryan has also been at the forefront of a conservative policy movement to deny Americans who lack that luxury the same privilege, particularly through vicious cuts to SNAP, Medicare, and Social Security. Here’s just a couple of reasons why Ryan’s policy hypocrisy matters, in five maps and charts. 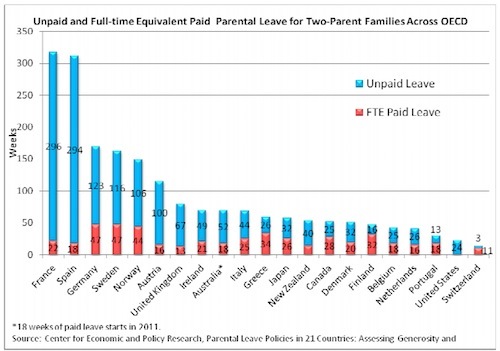 This gets repeated a lot, but it bears repeating again—We’re the only country in the world to not guarantee paid family leave. The Family and Medical Leave Act only enables 12 weeks of unpaid leave. The result is devastating—a fourth of mothers return to work within two weeks. We also provide no paid paternal leave, unlike many European states. It’s hard to have the ability to take weekends off, and maintain family time, without workplace flexibility. Most workplaces aren’t as flexible as Ryan’s, and that causes big issues, particularly low-wage workers. 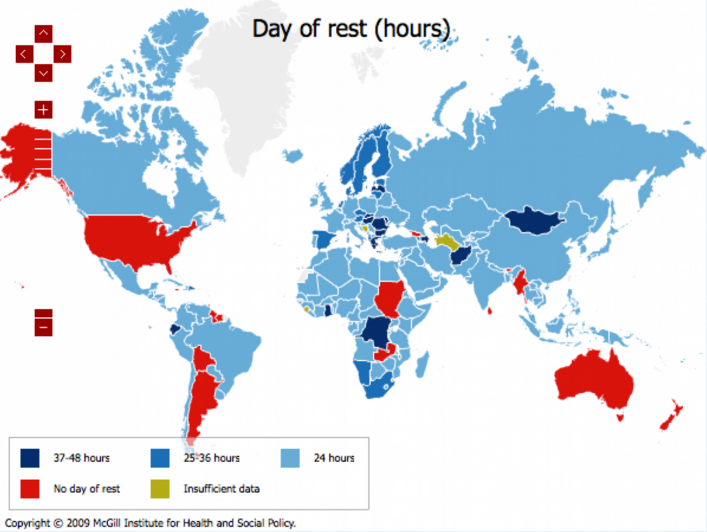 Unlike many other countries, the United States guarantees no paid time off. 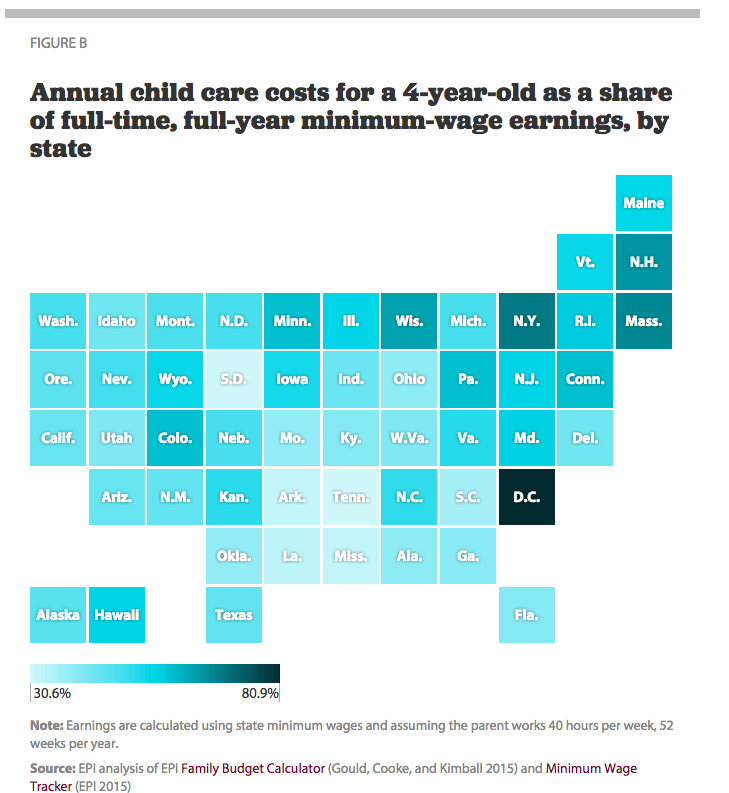 Moreover, without time off, it’s nearly impossible to afford childcare, which now costs more than rent, and college, in most states. This makes it nearly impossible to afford if you make the minimum wage. All in all, we rank dead last in how much we provide new parents overall. Recently, President Obama decried our broken safety net as being straight out of Mad Men. He’s right. We need 21st century benefits. Just to start—Paid family and sick leave. A significantly higher federal minimum wage would help. So would a federal plan to ensure affordable childcare. Paul Ryan opposes all of those policies. Not coincidentally, it’s working class families who need these reforms. Most don’t have the power, particularly with the collapse of unions, to negotiate for benefits. In a vacuum, the federal government has a huge role to play in enabling everyone to have a real balance between home and work. Let’s hope if he becomes Speaker of the House, Ryan’s next fight for work-life balance will be on behalf of the American people.